Hi friends! Christmas is behind us, (or really far ahead, depending on how you look at it), but I'm here to bring you good news of great joy. 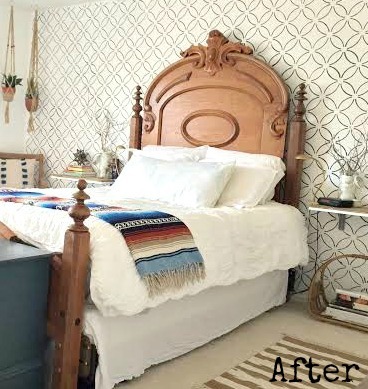 If you've been searching high and low for an affordable wallpaper and have discovered that your wallpaper taste is quite expensive, you might want to consider stenciling! (And at the bottom of this post, we've got the deets on a free stencil giveaway)! Obviously stenciling walls is nothing new. People have been adding borders and full wall patterns to their rooms for centuries. But, did you know you can purchase large sheets of a stencil pattern now, making the process a gazillion times easier and less time consuming? I know! It's unbelievably life changing, right?! Well, it was for me! I really wanted to give our master bedroom a more boho chic look and modernize our family heirloom bed. The headboard is quite stunning and grand, but it's not a look even remotely seen anywhere else in our home. I don't need or care to have every room in our home looking the same from one to the other, but I like there to be some continuity in the mix of styles. Our bedroom was previously a one-style show with the headboard taking center stage. And it was a bit of a diva. I couldn't figure out how to mix anything else into the room until I finally thought about adding an accent wall right behind the bed! So I searched and searched for the right wallpaper to do the job and fell in love with a gorgeous print - at $225/roll. Given the size of our wall, this would have cost $900. I kept looking around, trying to forget the one I'd fallen for, and ultimately decided no paper was going to come close. So, I changed course and decided to go the less expenisve route and stencil! I happened upon an amazing shop on Etsy called Cutting Edge Stencils. They sell most of their stencils by 2'x3' sheets, and include border and edger sheets as well! For less than $40, I got a gorgeous 2' x 3' stencil sheet, an edge/corner stencil sheet, and incredibly helpful instructions for the best supplies and paint to use for stenciling. This was my first experience stenciling a wall, and the process couldn't have gone smoother - and it was completed in less than 2 hours! Here is a side-by-side of our bedroom before stenciling and then after. I can't believe I didn't do this sooner! Our room looks much more 'us' now - so eclectic and laid back. Definitely snapped up! To get this wall finished in 90 minutes, I added blue tape to the corners of my stencil sheet, stuck it in the upper right corner of the wall, and got to work with my small roller. The key to keeping the paint in the stencil and not smudging was NOT overloading the roller with paint. A tiny bit really goes a long way. Then, I'd gently peel the stencil sheet away from the wall, line up the pattern, and re-stick to do the next section. This whole section (plus another column I cropped out), was done with one sheet in about a minute. Stenciling for the win!!! The hardest part of this project was moving the furniture away from the wall, (and that is included in the 2 hours I said this project took me). Fun fact: I found that chair outside of an auto shop when the kids and I were waiting on an oil change. When I asked about it, the shop owner didn't even know it was there! It just needed a good scrub and a new seat. Quite the transformation for $40 and less than 2 hours of time! A full tour of our updated boho bedroom can be found here! If you've been considering adding a patterned wall to your home, my recommendation for Cutting Edge Stencils is sky-high. And guess what?! They're offering one of our readers a free stencil! Enter here for your chance to win a stencil of your choice from Cutting Edge Stencils!